Watchable documentary that showcases some impressive a cappella rap performances and provides the occasional amusing anecdote, but Ice-T's interviewing technique leaves a lot to be desired and the film never really gets to grips with its subject matter. Directed by and starring Ice-T, Something From Nothing: The Art of Rap is a documentary in which the rapper-turned-director interviews a veritable Who's Who of rap artists (including everyone from Redman and Grandmaster Caz to Mos Def, KRS-One, Ice Cube and Eminem) across America in an attempt to uncover some of their techniques and discover what rap means to them. He also asks each person he interviews to deliver an unaccompanied rap routine to camera, some of which are made up on the spot. The film actually works much better as a sort of compilation performance film than it does a documentary, because the to-camera rap routines are the most interesting and exhilarating sections of the film, particularly Kanye West's lengthy performance and KRS-One's obviously made-up freestyle routine. Xzibit's rap is disappointing by comparison, but he does have some very nice wheeled garden chairs to make up for it. 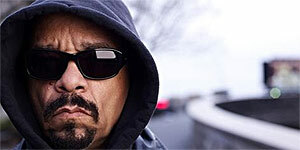 The interviews themselves are entertaining enough and there's the occasional amusing anecdote along the way, but Ice-T's technique leaves a fair amount to be desired and too often the interviews become repetitive or sycophantic, or end up giving frustrating non-answers to the important questions; no-one is especially illuminating on the actual craft of writing rap songs, for example, and it would have helped to have at least one of the artists involved actually break down and analyse whatever they were singing/composing. In addition, while it's heart-warming to see so many rap artists sing the praises of their peers and influences, it's also frustrating that none of the East Coast-West Coast rivalries are touched upon. There are also notable omissions, such as Jay-Z and LL Cool J, which seems a little unfair, since almost everyone else you can think of shows up at some point. While Something from Nothing doesn't really touch on either the history of hip-hop or the details of the craft involved, it's still worth seeing as a performance film and it leaves a lasting impression of rappers as essentially modern-day poets, even if none of them seem quite capable of articulating what actually goes into producing their work.